A large majority of our population waste a lot of time on the Internet. It is a very easy thing to do in this generation of information addiction. I am just as guilty as anyone else for having wasted many valuable hours surfing aimlessly. Since becoming a full time business owner over 2 years ago, I have been introduced to an entire community of people who instead, leverage the Internet, as a tool for both personal and business development. The true power of the Net comes form the fact that any person with ideas to share can create their own platform to speak from. Typically this comes in the form of a personal or business blog but it can also be done through social networks, online forums and podcasting. As a success coach, the biggest problem I witness is the lack of follow through and persistence towards personal goals. In general, people have no problem actually setting and planning their goals but they falter when it comes time to turn the goals into reality. One of the most common causes of this is the lack of accountability. Think about this form the perspective of your own life for a second. Imagine setting a goal to run a marathon. You could set the goal privately and write down on a piece of paper that you intend to complete a marathon in 4 months time. In this case, you are your only source of accountability. Another option would be to declare your goal publicly to friends, family, colleagues, etc… There is obviously a built in sense of motivation when you know others are tracking your progress. The anticipated pain of embarrassment may very well be the one driving force that causes you to actually reach your marathon goal! So how does the Internet help with self development? When you think of most personal development programs and exercises, pretty much all of the teachings are geared toward behaviour change in one way or another. Behaviour change is typically the result of action repetition. Once you have decided on a goal that you would like to achieve, you can easily use the Internet as a tool for both activity management and personal accountability. Example – My friend and mentor Brad Gosse (http://www.bradgosse.com) is quickly becoming a widely recognized authority in the Internet Marketing arena. He literally uses his blog as a tool for personal and business development. Brad has a schedule that he follows to the letter. Every Tuesday and Thursday he creates a high value piece of content for his readers. As I have followed his blog for the past year, his skill level has continued to rise along with the size of his audience. Because his readers expect him to deliver new content weekly, Brad is forced to continually grow and adapt his skill set. He literally has a built-in accountability system that forces him to deliver week after week. Brad also happens to be one of the most successful entrepreneurs I know and I don’t think this is an accident. The good news is you do not have to be a technical wizard like Brad in order to leverage the Internet as a success tool. There are plenty of free and user friendly platforms that anyone can use to build the same kind of system. 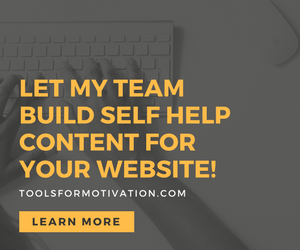 As a success coach and an internet marketer, I can’t help but embrace this incredible opportunity we have to leverage the internet as one of the best personal development tools we have ever had at our disposal. Please share your comments as to how you see yourself using it to help you reach your goals! The more I pledge my plans online the more I feel accountable for them. My focus has never been sharper partly due to this. I agree with the accountability idea. And routine is so important when trying to evolve your online offerings. We are still amending our routine regularly and need to develop a more consistent regime. I’ve been slacking totally lately after the start-up of my new blog. And I keep excusing myself (I was busy, the baby’s taking up a lot of time, it’s difficult to combine a full-time job with blogging). So I took a big decision! From the end of january, I’m gonna be a full-time blogger. And exactly, set a schedule for writing, publishing, tweeting, networking, the whole deal. Thanks for the wake up call, Justin! That’s awesome! Congrats for taking such a big leap in your life and business. Keep me posted on your blog and I look forward to watching your success. people will pass overr yoour fantastic writing due to this problem.